No matter who you are or how old you are, whether you grew up in Kansas City or somewhere else, if you close your eyes right now, chances are you can picture being in the halls of your elementary school — what it felt like, looked like, smelled like. You remember the games of foursquare and kickball at recess, the 4th grade art projects, the class pets, the way it felt to sit in your desk, the haircut your 3rd grade teacher had. 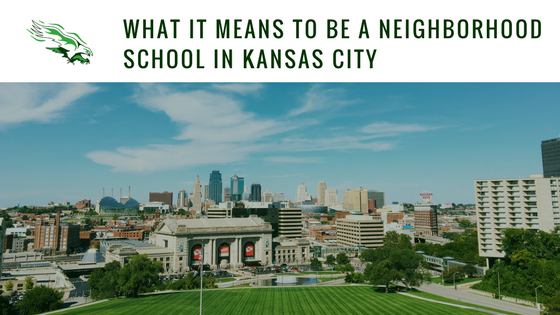 With school choice in the Kansas City, Missouri School District, parents have the ability to send their kids to schools across the city. It used to be that all public schools were defined by neighborhoods, with children attending schools closest to the neighborhoods they lived in. This is no longer necessarily the case. Although Hope Leadership Academy is a public charter school, we are also a neighborhood school, dedicated to serving the children and families in our own neighborhood and to giving them the foundation they need to succeed in life. As a school, we are a reflection of the strength of our community and aim to be a center of community for our neighborhood families. At neighborhood schools, children have the ability to walk to school together, to play together, to easily work on group projects together, to build neighborhood connections together. Parents become friends and community partners, and teachers become leaders.